To serve the special mission market, Textron Aviation has fielded a dedicated team to help customers select exactly the right product, according to TJ Whitfield, director special missions. The team consists of engineers, supply chain experts, program management, technical solutions, operations and other specialists. “We’re able to meet with customers and adapt and get them a solution quickly for their mission profile,” he said. 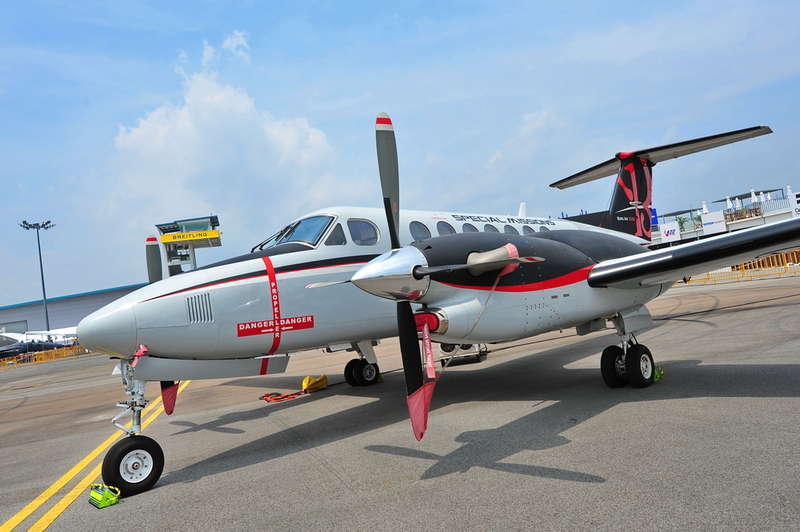 Textron Aviation brought two special mission aircraft here to its Paris Air Show static display (A4), a company-owned 208B Grand Caravan EX and a French customs King Air 350ER. Alongside the Caravan, which is powered by the 867-shp Pratt & Whitney PT6A-140, is a static demonstrator wing equipped with hardpoint provisions to illustrate the various products that can be attached, including weapons and ISR equipment. Textron Aviation is showing the wing equipped with dual Hellfire air-to-surface missiles and dual Textron Systems triple Fury glide munitions, both installed on rails. A Textron G-Claw glide munition launcher is installed in the cabin, illustrating its capability for launching outside the airplane through the open rollup door. The hardpoint is not yet certified to accommodate extra fuel tanks, but is being shown as a mockup to illustrate future capabilities. This system could be developed internally by Textron Aviation or may be offered by a third-party. This Caravan is also equipped with a demonstrator ISR module inside the cabin, by Churchill Navigators, as well as a Spectrum Aeromed stretcher and life-support system. Read the rest of the article at AINOnline.com.